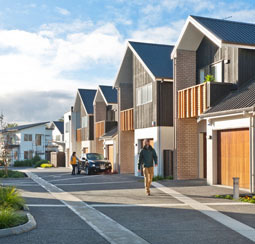 Prioritise pedestrian convenience and access to destinations in the design of subdivisions. ​​​​​​​​​​​​​​​Walking brings direct health and lifestyle benefits to communities, as well as a more efficient use of transport infrastructure and increased consumer spending. 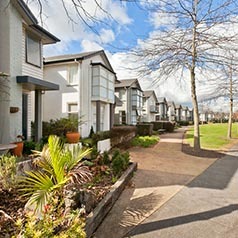 Subdivisions should be very walkable, with generous footpaths and landscaped berms. Pedestrian routes should be designed to be well overlooked by vehicle lanes and property frontages, to provide passive surveillance. Road placement and orientation should be based on providing route choices that are direct and allow pedestrians to intuitively understand where they are going. Pedestrians should be able to primarily travel in a straight direction and should never have to walk in the opposite direction to where they are headed. Footpaths take precedence over vehicle crossings. Continue the gradient and material of the footpath across the top of vehicle crossings, and design transitions to maintain the levels of the footpath. When vehicle access to lots from the street is not permitted (for example along high-speed routes), lot design and the location of buildings should ensure that buildings still face and overlook the street. Avoid rear lots as they do not encourage walkability. 1. 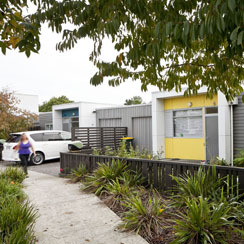 Subdivision design should maximise the area and the mix of activities that can be accessed from each lot within a ten-minute walk. Able-bodied adults can walk at an average speed of 1.5 metres per second, or up to 800m in 10 minutes, accounting for occasional delays. Consider a slower speed of around one metre per second if the target market for the subdivision includes the elderly or families with young children. 2. Subdivision design and layout should consider how easy it is for pedestrians to access public transport routes (existing and future) and local reserves. 3. Where rear lots are unavoidable, limit them to less than 10 per cent of the total number of lots in the subdivision. 4. 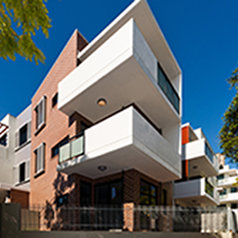 Reduce block sizes as the density and number of residents increases.